I'm in a cupcake mood. I know Chef Duff wouldn't approve but I can't help it. I'm being sucked in by the cupcake culture that is taking over our planet! For example, I went searching online for cupcake recipes. HOLY MOLEY! I knew it was a crazy cupcake world out there but I guess I didn't realize how bad it had gotten. Cupcakes filled with EVERYTHING you can imagine. Beet cupcakes? WHAT!? Gross. 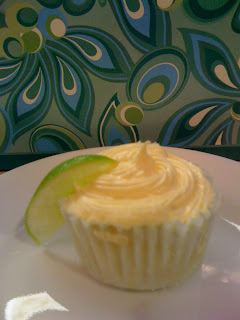 But I did find something I could get on board with - cupcakes baked with booze in them. I found a list of cupcakes that were cocktail themed and in that list were Pina Colada, Daiquiri, White Russian, Champagne, etc. I am all for this! So when I got invited to tostada night at a friends house, a friend who due to some of the mighty meds shes taking, can't drink at all, I thought about bringing over one these cocktail cupcakes. And what goes better with some homemade Mexican than margaritas! HOWEVER, upon reading recipes and searching the internet I came across some important information: NOT ALL ALCOHOL IS BAKED OUT OF FOOD! In fact in the case of cupcakes, almost 40% of the alcohol is still left. It would take more than 3 hours to cook out all the alcohol in baked goods. Now who is going to do that? Anyways, back to the cupcakes, I found that I needed cupcakes that tasted like margaritas but had no tequila and grand marnier to be on the safe side. However, I found so many great recipes non-virgin recipes that I decided to make two batches, one without alcohol and one with! 1. Line the cups of a 12-cavity muffin pan with liners. Preheat oven to 350 degree F.
2. In a large bowl combine the cake mix, margarita mix, orange juice, egg whites and vegetable oil with a mixer and beat until well blended. Stir in the lime zest. 3. Fill muffin cups 2/3s full; you will use half the batter. Bake 22-24 minutes. Remove when a toothpick inserted in center comes out clean. Remove from oven and cool 5-8 minutes. Remove from pan and complete cooling. 4. Line the cups of the muffin pan again with liners. Repeat filling the liners with remaining batter. Bake and cool as above. 5. 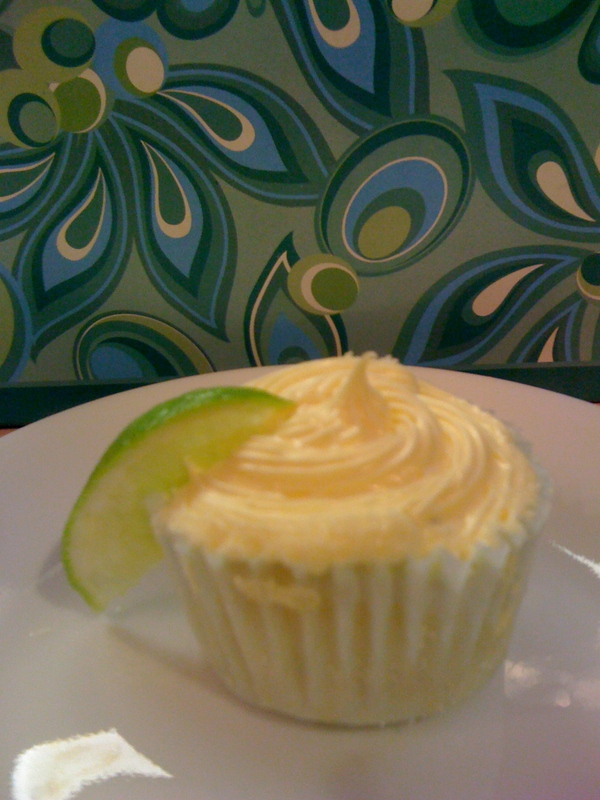 To make the icing: Mix lime juice and zest into butter cream frosting in a medium size bowl. 1. Preheat oven to 350°F. Line two dozen cupcake tins with paper liners. 2. 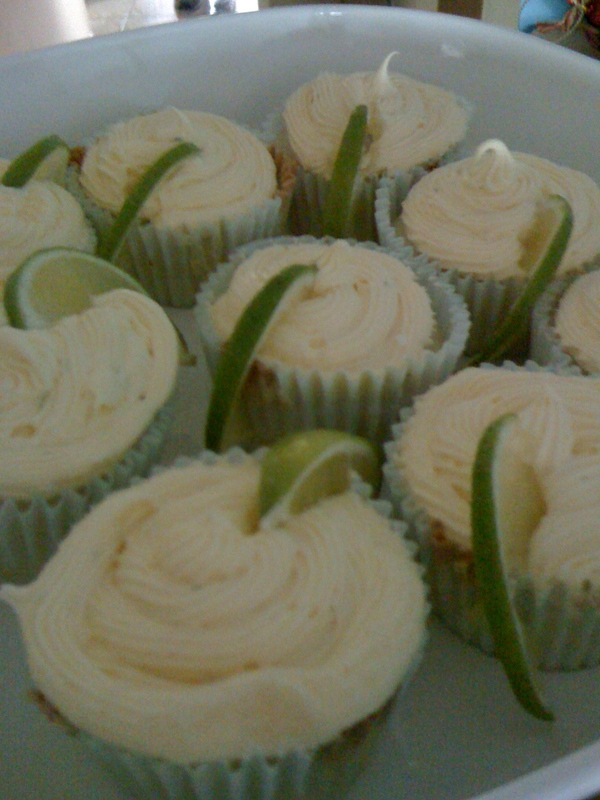 Prepare cupcakes: Whisk together margarita mix, tequila and Grand Marnier in a small bowl. Measure out 1¼ cups for the recipe; pour the rest on some ice and drink it while making the cupcakes. 3. In a large bowl, blend cake mix, egg whites, vegetable oil, lime zest and 1¼ cups of the margarita mix from step 1. Blend on low for about 30 seconds and then increase speed to medium and blend for two additional minutes. Batter will be slightly lumpy. 4. Spoon the batter into cupcake liners (about ¾ full). Bake for 20-25 min, or until toothpick inserted in center comes out clean. Let cupcakes cool for about 10 minutes in the pans, then remove them to a rack to cool completely. 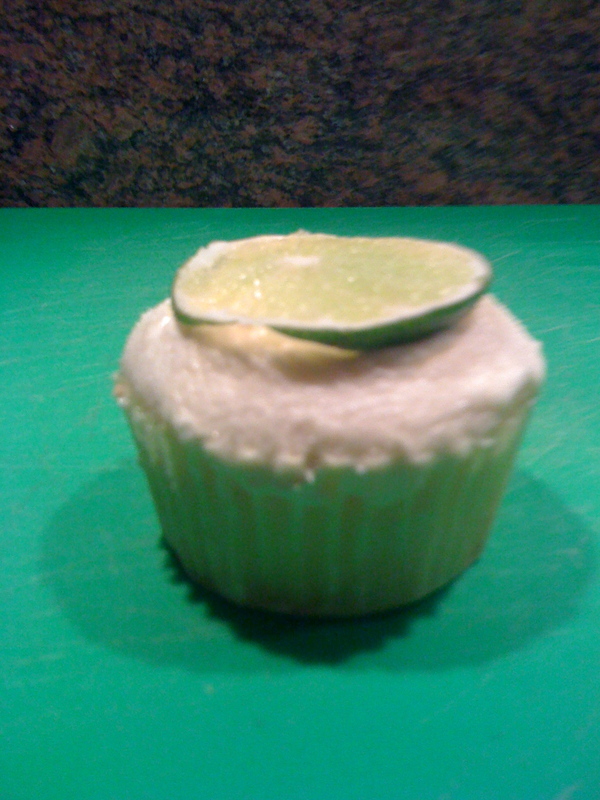 It's hard to see but I sugar rimmed both types of cupcakes to give it just bit more "margarita" feel. Top them with a lime, however you choose, and serve to friends. I took the first batch to dinner. Got some rave reviews. And then I had my boyfriend take the second booze filled batch to work. His co-workers REALLY like them. I think I did good. 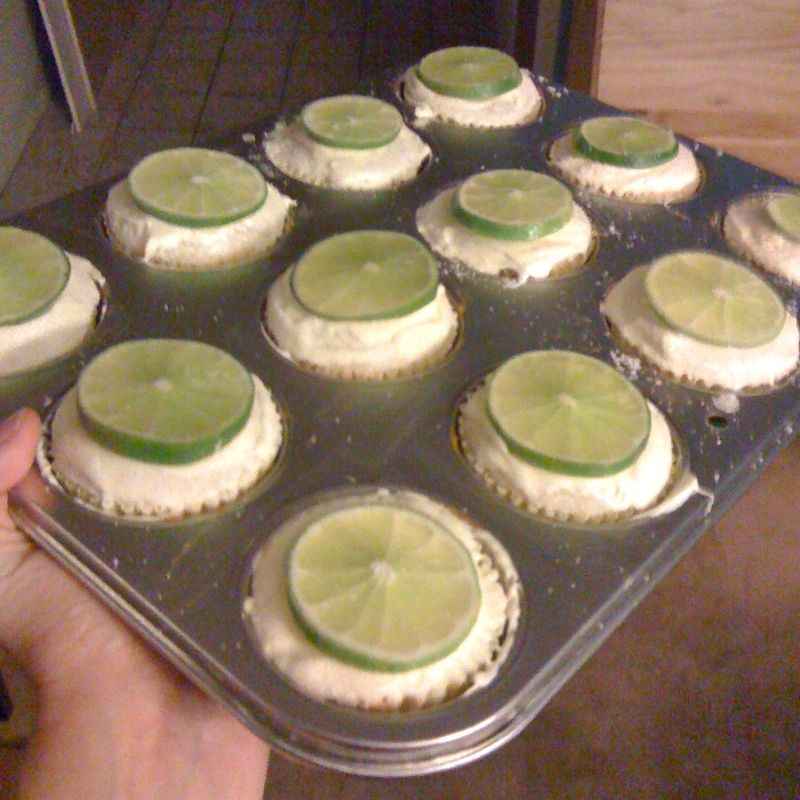 I realized after making, and eating, and passing them out, that everyone took the lime slice, as pretty as they were, and chucked in the garbage. I thought, what a waste! Solution? Candied Lime Slices and plain ol' candy! Check out this recipe fro Candied Lime Slices. Another option is actual candy! I've found some really cute lime slice candies in the local candy store. Sour Patch Fruit salad also has small limes you might want to try! p.s. I'm really trying hard to improve my food photo skills but not having much luck. I think part of the problem is I sometimes use my phone. And by sometimes I mean most of the time. But I'll keep working on it if you all promise to keep coming back! OMG, I have been making a huge variety of alcoholic cupcakes for years and never realized that the booze doesn't bake out. Thanks for the link! I'll have to do some more research on it. I'm getting married in about 6 weeks, and these will be FABULOUS for my bachelorette party!! PS -- love the site makeover! Shannon, I can't get on you profile, so I can't respond back to you anywhere but here! I'm glad you like the cupcakes, and the makeover. I have a few suggestions that I'm gonna add to the decorations. Just thought you should hear them first! Instead of regular limes, which most of the people jsut tossed, might I suggest the large candy limes. I found some at a candy store. They were perfect. Also sour patch fruit salad has limes. OR if you want something more authentic, you can candy the slices of lime. Check back for directions on how to do that! Oh and YEAH WEDDING!! Your pictures look great, if you really want to get fancy, I recommend a tripod and a more natural light, to eliminate shadows produced by flash!! And I am also super excited to have a nifty way of sneaking a 'drink' into work on those boring nights!!! wow Amy! both of those cupcakes look delicious!! You have been so busy lately too, your blog looks amazing! I cannot wait to try these recipes, i think i will try both to compare, yum! FINALLY made these this past weekend!!! AWESOME recipe!!! !